Rated 5 out of 5 by mommabear1977 from Couldn't walk away. I loved this game. Great story line. Rated 5 out of 5 by LADY_BLADE from Another great Myths of the World,,,bravo!!! This is a beautifully developed and great game next to what has been offered up lately. I beta tested it and gave it 5 stars then. The American Indian setting is great (at least it's not another haunted run down building). Some of you don't like the cutesy games but I enjoy them. I love the artwork and gorgeous scenery. This game is fun to play and you have several choices in playing. I love that it has a transport map. It has an amulet to get rid of glowing signs, binoculars to see far off, collectables, and achievements. 1 thing i did not know til the end of the game is that each HOS has a "gold hand" you have to look for & collect as well..But what's not to like? Some of the new games don't even have full-screen. Rated 5 out of 5 by Likem_good from Third myth is definetely worth the time Liked the Healer, Spring so/so, but this time, the wolf is coming to grab your attention! A new mystery myth this time set up in north America, while you try to iron out a dispute centuries old! I definitely enjoy traveling through time and space, and this one takes me to places I've never been. A big thank you for the developer! Rated 5 out of 5 by 408newport from love the games I love every thing about the game . Rated 5 out of 5 by meandmo from Beautiful graphics and fun to play! I am not a huge fan of HO games but love to play one that makes you think, has fun mini games and the hidden object games are not so hard that you can't find anything. I thought the graphics were wonderful, the story line was different and the pace of the game was good. I have bought games that I have never finished because they became so difficult and tedious that I quit. Those aren't fun to me. This game is fun. Rated 5 out of 5 by yogijudy44 from Love Myths of the World games... This is a beautifully developed and great game next to what has been offered up lately. I beta tested it and gave it 5 stars then. The American Indian setting is great (at least it's not another haunted run down building). Some of you don't like the cutesy games but I enjoy them. I love the artwork and gorgeous scenery. This game is fun to play and you have several choices in playing. I love that it has a transport map. It has an amulet to get rid of glowing signs, binoculars to see far off, collectables, and achievements. So what's not to like? Some of the new games don't even have full-screen. As for me, I'm buying!!!! Rated 5 out of 5 by Tiger2010 from Another great game from a top developer BASED ON WHOLE GAME AND BONUS Exactly a week after the last wonderful game, comes an equally fantastic Collector's Edition from this developer. As ever with Eipix, the graphics are colourful and crisp and the voiceovers second to none with near perfect lip synching. The theme is Native American throughout, which is a personal favourite of mine. The music was suited to the game, suspenseful in some place and typically Native American in others. The teleport map is, once again, a piece of art by itself. There are no furry helpers here. You find tiles throughout the main game that fill your Amulet which is used to disperse spirits. There is a sun rune collectible to find in every scene and they are not hard to detect. The HOPs are a mix of the usual lists and silhouettes and I counted a massive 30 HOPs in the main game, with 5 in the bonus. Not all are full length HOPs, some of these are 'minis' with only 5 items to find. The puzzles weren't overly difficult - 32 in the main game and 4 in the bonus. You can play a bubble shooter game if you get tired of the HOPs. There are also 7 binocular puzzles. These are easier to do than the bow and arrow in the last game. The game took me around 5 1/2 hours with 1 hour 15 minutes for the bonus. The main game is finished off nicely and completely with the usual dramatic ending from Eipix. There is nothing overly scary here. However, in the bonus you use your Amulet to get rid of some animals that are mutations and they are not pretty. One was a Tarantula/Horse/Eagle. There are 7 mutations in all so if you don't like this, you may wish to wait for the SE. As ever, you have a souvenir room after playing the bonus to find an extra object in each scene. You can reply the HOPs from the Extras to try to earn all golden paws. The 'Making of' video is a bit of fun and Bonnie from the last game makes an appearance in this. Another fantastic game from this top developer. Highly recommended! Rated 5 out of 5 by pennmom36 from Fantastic Native American Lore! I absolutely loved this edition of Myths of the World which delves into Native American culture, the graphics are stunning and the soundtracks simply wonderful. There are 35 Sun Runes to collect and missing pieces of your eagle amulet which helps you to lift the spirits from certain items. You come equipped with binoculars which have to be adjusted in 4 sections right, left, top and bottom. I thought the HOS were very well done and they were very interactive list finds as well as finding items that matched the silhouetted shapes. Mini games are fun such as swapping tiles to create a complete picture. You can choose to customize the mode of difficulty to exclude sparkles or lower and raise hint and skip times. This is a very exciting, well produced game and who doesn't love wolf spirits and Native American folk lore? Enjoy! Rated 5 out of 5 by FireCoral82 from Summoning the Awesome OK I dont review very often just because most people end up sharing my sentiments on those games in which I would even consider reviewing. However, this game is just too good to pass up. I have to preface this by saying I just finished the demo and of course WILL be purchasing, but this review is only on the first 60 mins of game play. I found the puzzles fun, and the hidden object scenes challenging enough without driving you bonkers. There is an interactive map, amulet (cool touch) that helps when coming across new symbols, and a diary. Also I found the binoculars function to be really neat, haven't seen that in any other game. I don't know how long the actual game is but from what I played its a nice pace. I have to say this is by far better than the last Myths of the World game (although I did like that one too it seemed at times to simplistic) and a tie as by favorite with the Myths of the World Chinese Healer. CE vs SE hasn't ever been an issue for me as 9 times out of 10 I never touch anything that comes with the CE i.e. concept art, wallpapers or achievements but I buy it because of length of game and time/bonus chapters. Again I would defer to another member on game length and bonus content since I don't know about either just yet. P.S. and by the way, as a Native American myself I found the game to be beautifully done, I found nothing offensive about it and I trust that this gets people interested in the culture ;) Well done!!! Rated 5 out of 5 by hibc60 from another good game in the ceries I have always enjoyed this ceries of games and this edition is no exception. I just did the beta test and was surprised to find out it is coming out so soon. the only issue I have is I don't care about extras and really don't know if I will get the collectors or wait till the regular version comes out. great hint button, great map. not sure collectors is for me but I will get this game eventually. Rated 5 out of 5 by MSBAM100 from A Glowing Amulet, a Spirit Wolf, and Giant Mushrooms! This is the third in the Myths series and it doesn't disappoint. This time you are summoned by your friend Jesse to the Center for Native American Culture to deal with some strange happenings - glowing symbols, supersized mushrooms, and spirits. Of course you also have an amulet that begins to glow when you enter the grounds! Once you assemble your drum and beat it, the spirit Ayanna appears and asks for your help with Misu, the escaped wolf/man spirit. 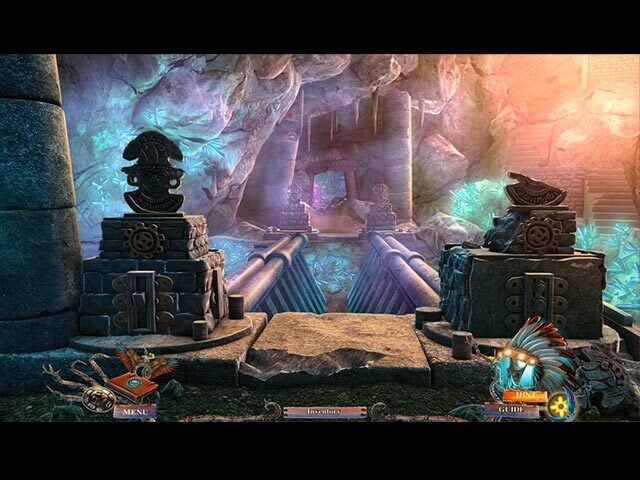 The entire game sticks to the native American theme, from the hint button headdress, to the graphics full of totem poles, to the spirits that appear. The HOS are interactive lists or silhouettes, and can be swapped for a bubble shooter. 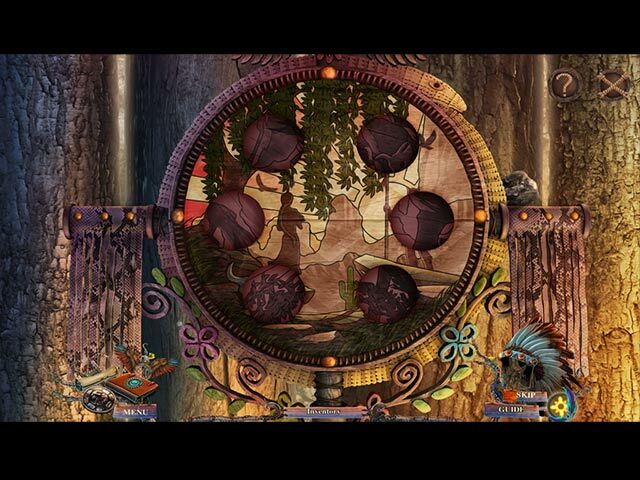 The mini-games all have Native American themes but are not too hard. You have an amulet that you add symbols to as you find them, which enables you to overpower the symbols on doors and other items. Some of the items you find require assembly with other items, like adding batteries to a flashlight. There are four modes, including custom. The achievement awards are dreamcatchers. There are 35 sun runes to collect, with a "sun sign" in each scene that lets you know if you've collected that one or not. You receive binoculars that let you focus in on distant scenes. There is a bonus game and a strategy guide, an interactive map showing areas with objectives, plus a sun path and souvenir site that cannot be opened until the game is completed. Of course there is also the normal CE extra stuff of movies, art, etc. This is a great game with a good theme that is followed throughout each part of the game. Try it and you'll see! I also recommend the two previous titles -- great games as well! Rated 5 out of 5 by biscuitsmama from Another Great Myths of the World As the game begins you are on your way to help an old colleague, Jesse Whitecloud who runs the Center for Native Cultures. As an expert in the field of Native American symbolism, Jesse has requested your help with strange glyphs that have begun to appear around the center grounds. As you approach the center you notice that your amulet, a family heirloom, has begun to glow – something it has never done in the past and you soon understand why Jesse is very concerned. Not only are there glowing symbols everywhere, but the mushrooms have grown to one-hundred times their normal size. What on earth is going on? The graphics are great quality and really very beautiful using the color palette of the American Southwest and Native American culture. The only complaint I have about the graphics is that at times the developer used a smoky mist that I believed compromised the clarity of some scenes. The sound package in Spirit Wolf is wonderful and one of the reasons that Eipix recommends using the sound in their games. The music includes the sounds of the Native American culture with drums and flutes adding to the overall ambience. You have a diary and a transporter type interactive map that are located on the lower left of your screen along with your amulet that you will use throughout the game to interact with the symbols that you find on your journey. There are various types of interactive HOPs, some are the standard list type and others are silhouette type. If you don’t want to search for items in the HOS you can change to a bubble shooter type game that is quite a bit of fun. It looks like this game has an equal number of each HOPs and mini-puzzles if I counted correctly. At least in the demo portion of the game the puzzles were not overly complicated or difficult but I am sure that they will become a bit more challenging as the game progresses. As with all EIPIX games we have tons of extras that contribute to the CE Content. Usually I don't care about the wallpapers but since this game has such awesome graphics I may actually use some of the wallpapers on my desktop. There are collectibles to find and achievements to earn, some of which will be used after you complete the game. All in all, this is definitely a CE worth adding to my collection. Because I have always had a deep interest in Native American culture, I knew this game would grab me and it has. It is a visual feast complete with all the sounds that I have come to associate with Native American culture. The story is very interesting and captured my attention from the beginning, and since I know the quality of games that come from EIPIX and the way their games can sweep me away to another time and place for several hours of immersive entertainment, I knew that this game would be a definite buy for me. As always, I recommend that you try the demo to see if Spirit Wolf is a game that you will enjoy. Rated 5 out of 5 by BFGMCFFAN from Another great Myths of the World game - Can you save true love? The Myths of the World series is moving forward very fast. This is now the third installment and it's another lovely game. Like in the other two it's a Myth with enduring power! The storyline: You are called to a native american center, because there are strange symbols appearing and other unusual things happening. As an expert with a magic amulet, you discover an old love story between two lovers and the lovers brother, who also fell in love with the girl. Can you save the old love and reunite "The Spirit Wolf" with his love, or will Misu destroi everything. The graphics are woderful, as you can expect it from Eipix. They're clear and detailed and have a great atmosphere, that's really good for the native american theme. The characters appear to be drawn. There are voiceovers, which are clearly understandable, and without spelling errors, as far as I could see. The voices fit together with the characters they belong to. The soundtrack is great. I really love the music, because it has a great atmosphere, that fits perfect to the game. Great job here. The level of challenge is only good again. Mini-Games are very easy and no real challenge, but there are new mini games in this game and only a few old reloaded ones. There are two different types of HO's in the game. Normal lists and shadows of items. You can play a bubble shoot game instead of HO's if you want to. While playing you have to use binoculars and you amulet to make progress. For the amulet it's necessary to find more parts while playing, but they aren't hidden, You can just collect them like every inventory item. There are around 20 achievements and 35 collectable symbols, which you can collect through the whole main game. There are 4 playing modes, casual, harder, for the hardest and a custom mode. The CE comes with the usual extras in a Eipix game and again there's a souvenier room and you can collect stars for replaying the Hidden Object Scenes. Afterall I rate this game with 4,5 stars (5 stars). It's a great game, but I really hope that the next game will be harder. I would love to see another challenging Eipix game in the future. But this one is another worthy CE! Keep up the good work guys!!! Rated 5 out of 5 by Unclebozeat from Haunting After one hour of the trial had to buy the full version. I already own the others in the series all excellent but this seems to be more of a challenge than the others. Rated 5 out of 5 by 43Colorado from Symbols, Myths, a Glowing Amulet and a Spirit Wolf! Fun! Based on demo. You agree to help a friend at a Native American Cultural Center and when you arrive your amulet begins to glow. How mysterious! Then spirits arrive, including an elusive wolf spirit, and the game begins. This is the third game in the Myths of the World series. I like this series. I feel as though I'm an anthropologist with a new field of study each game. First it was China, then Scandinavia, and now North America and Native American culture. Each game feels authentic to me and I enjoy the immersion in another culture. This is a true CE. There are lots of achievements to earn and sun symbols to collect. The graphics are very good and make me feel as though I really am at an Native American Cultural Center. The VOs are terrific. The characters mouths move when they speak and the dialogue moves the story along. HOSs are silhouette and list type. I did find some of the objects difficult to locate due to the style of the graphics, but it's not overly distracting. You can opt to play a shooting marble game instead of playing the HOS if you want. The puzzles are of easy to medium difficulty. I think you will enjoy this game. It is fun and appropriate for the whole family. Rated 5 out of 5 by sfr8rfan from Must be a Wolf. It ain't no Dog! An old friend has called you to help him sort out strange happenings last night at the North American Heritage site. As you travel there an amulet that has been in your family for generations begins to glow...just as strange symbols appeared at the Heritage Center and began glowing as well. You use your expertise in symbology to solve the mysterious events of the distant past that revolve around love and betrayal...and the epic myth of the wolf FUN FACTOR: Dan Brown and the Da Vinci Code meet Native American Mythology. This game is stunningly beautiful to the senses and will thrill you as you play. That Amulet that's been in your family proves to be an invaluable tool...And you'll find out how if you decide to play. No mystery here for me. Yes, this is a worthwhile game. I thought the FUN FACTOR was off the charts because: VISUAL/SOUND QUALITY: Visuals: Grand Canyon at night is a "cavalcade of color" with rich hues. The developers created something very special and the painters knew what they were doing. Sounds: From the first second of the Eipix (the developers) intro music you're immersed in sound. Both background and special effects are very well executed. Level of Challenge: HOGs: There around 25 HOGs. There are two types: regular HOGs and Mini-HOGs. The first is the usual "pick em" list. The second is silhouette matching (and no more than six items. Both formats are difficult. The most difficult I've encountered in game playing. The scenes are richly packed with items. It is NOT a junk pile. Items are very clear and distinct but they blend with the background so perfectly they are very difficult to see. Mini-Games: YES. Some brand new games for you to enjoy. There are approximately 20 mini-games and some of them you've never seen before. They range in difficulty from "do it with your eyes closed" to "I think I need the Strategy Guide." But, don't give in. You'll solve the puzzles. Look out for the one with the beads later in the game. The directions aren't perfect, but the gaming and fun is. Storyline: See above. This game is another great combination of HOG/GAMES/STORYLINE. If I tell you more than I did above I'll be taking away some of your fun. The storyline drives the game and it's very engaging. As a CE there are plenty of extras: 1. Achievements (including one that's good: finishing HOG without and over-clicking penalty). Now that's an achievement! 2. Re-playable AND BONUS HOGs. 3. Concept art, re-playable music, movies. 4. The Making of the game video. 5. Jump-to Map which indicates where you are, where you can go and reminds you of the task at hand. 6. A Bonus Chapter thats all about the amulet. The bonus chapter has around 10 HOGs and 3-4 mini games and is about 20% of the length of the basic game. 7. Integrated Strategy Guide (that includes a game play clock!!). I don't think there's a SE yet. I wouldn't wait for it. As always, I suggest taking advantage of the free hour of game play. While I very much enjoy the total immersive environment of this game, you may not. I just finished Stray Souls: The Dollhouse Story. Honestly, that game is much more along the lines of what I enjoy. It's dark and very scary. This is not. The quality is objectively very high for this game but it might not be frightening enough for you. Rated 5 out of 5 by JustTheFacts from Another Splendid Adventure BASED ON DEMO FIRST IMPRESSIONS Okay, it’s official. Eipix is now my absolute favourite developer. And this is one of my favourite series. But, while I love it, this game is not their best. We begin with our admittedly grandiose narrator reminding us of “the enduring power of myth”, which is fine, and then off we go for an adventure in North America. SIGHTS & SOUNDS Gorgeous of course, both in quality and art. Crisp clean graphics, brought to life with great animation. The spirit wolf is stunning. The locations and close ups are as spectacular as you’d expect. I was disappointed with the cut scenes, though. I thought they were markedly lacking in clarity. Sometimes I wasn’t even sure what I was seeing. What’s that all about, guys? Music and ambient sounds were great. Very appropriate to the story and varied enough to be interesting without getting in the way. Except for a really annoying humming sound in a couple of locations. Probably belonged there, though, and I just don’t know the meaning. Voiceovers are excellent, and the acting was also good. WHAT’S HAPPENING? Your friend runs a Native American cultural exhibit, and when he comes across some weird symbols that have started glowing, he calls you in as the expert. Your family heirloom, an amulet, starts glowing as soon as you arrive. Ghosts come forth claiming that you are the one to help them, you begin to see connections with a legendary lost civilization, and a spirit wolf seems to be following you. GAMEPLAY The base gameplay is straightforward HOP, Puzzle, Adventure Lite. The HOPs (23) are interactive lists or silhouettes. You can opt to play a Bubble Popper game as an alternative, or a bit of both. The Puzzles/Mini-games (23) are all doable and most are really very easy so far. Getting around and finding what to do is not hard, and is aided by an interactive jump map that tells you where you have tasks to do immediately. The hint is directional, and there’s a journal with basic information. So much for the standard stuff. As well... You have a set of binoculars, which you use when the cursor changes, for, duh, seeing faraway things. It comes with a simple mini-game all its own. So does you amulet. It destroys magical barriers. You need to find the pieces of the amulet as you go, and complete a simple mini-game to make it work. Other (standard) features include: game timer, combining items in inventory, and 3 levels of difficulty plus a custom one. CE BLING! Well, it makes quite a list. Wallpapers (8), Concept Art, Movies, Music, Making Of, Bonus Game, Strategy Guide, and replayable HOPs and Mini-games. As well, there is a Souvenir game (common to other Eipix games), a Sun Path game (which my guess is finding all the sun runes you didn’t get in the game), and Collectibles and Achievements. The collectibles are sun runes, all the same, and easy to find. The achievements are the expected, and are dream catchers, housed in their own section. COMBINED IMPACT Despite my criticisms, I really loved this game. Its atmosphere is lovely and all new to me, so I found HOPs especially fun and a little more challenging. I also love that the mini-games are not too hard. I am an experienced player, but there are still always puzzles I just can’t get. Eipix make the best quality games while not over-burdening my poor brain. 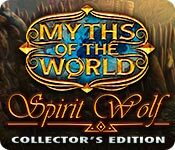 Rated 5 out of 5 by Nilosh from Excellent Sequel Myths of the World have proven to be one of the more successful series and with its third installment, Spirit Wolf, these developers continue to produce an excellent Collector’s Edition game. Our story’s theme deals with Native American culture which always holds a fascination with me. As an expert in Native American Symbolism, you are summoned to investigate a mystery involving glowing glyphs that are suddenly appearing at the Center of Native Culture. As you make our way there, you notice that your own amulet, a family heirloom, is also glowing. There seems to be some sort of connection between you and what is occurring at the center and your adventure begins with your first encounter of the Spirit Wolf. As always, I love that these developers use sound and special effects to enhance the overall gaming atmosphere. The graphics are good and art work very well done. Although I did notice that the resolution was not as sharp as I would have liked it to be. In comparison, I thought that the first game, Chinese Healer was done much better. Nevertheless, as we begin our adventure, you have four levels of difficulty which can be customized to your own personal settings of choice. Game play is your standard HOPA with extras that at times are distracting but nevertheless does make the game a bit more interesting. Your tools include a journal, an amulet that requires you to locate tiles and use it to remove symbol barriers and binoculars that help you to see far away. 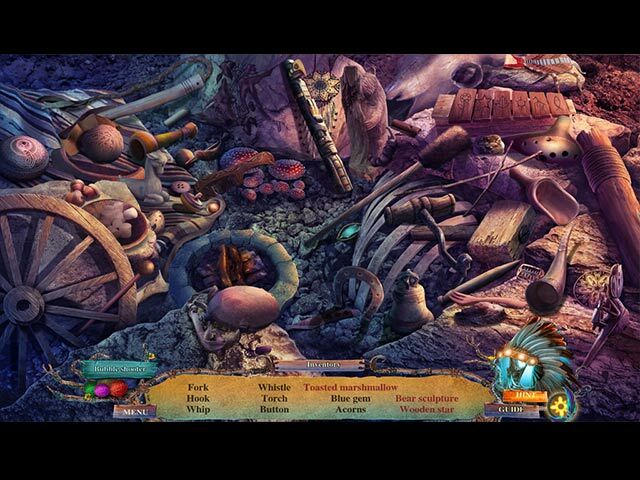 Hidden object scenes are varied, standard list with interactions required and silhouettes of items to be found. Mini-games are well conceptualized and some are even time-staking which I prefer. In this game, you also have the choice of playing the Bubble game which was not as easy as I anticipated. I love the bubble chain but this one does have a challenging quality about it. In addition to all this, you have sun symbols to collect, all 35 of them and you also have a list of achievements as well as a souvenir room to attend to. Overall I found the game entertaining and it does look to be rather time consuming. Still, the first of the series remains a favorite of mine when it comes to visuals, but still Spirit Wolf is much better than the second game which was geared more to family entertainment. I do however love the Native American culture and look forward to unraveling the mystery that lays before me. Rated 4 out of 5 by ninja226 from Long, challenging game with Native American flavor This is a very long game to play. The mini games range from easy to tedious to solve. It would be a hard game to play without helpful messages, hints and skip features. 30% actions are not intuitive and just strange. The story line is completely forgettable and the standard you-are-in-a-race-to-stop-the-bad-guy-from-releasing-a-magical-power-that-will-unleash-evil-in-the-world-as-we-know-it. The voice for the Spirit Wolf doesn't jibe with the image of the wolf--a wimpy, clownish voice for the wolf who represents the GOOD. Other than that discordance, the VOs and visuals for the characters and scenery are fantastic. Other special features of the game include the use of a binocular (lower right) to see items far off-->move the X-Y arrows until they turn green so the objects comes into sharp view. There's also a magic amulet (lower left, eagle icon) that glows when you come across hieroglyphics that unlock an object. You have to find stones in the scenes that belong to the amulet and then click on the symbols matching those hieroglyphics when they are found on the amulet to release the item. Did I tell you this was a very involved game? Nevertheless, if you want the most for your money or are a fan of Native American culture, this game provides many hours of challenging gameplay and beautiful NA graphics. The map function is not that helpful on intermediate mode. This is a game you might want to try before buying. PS--this review is for the SE version. Rated 4 out of 5 by crisgori from Not bad Even though there's no portal system this game has no backtracking and this makes it easier than it could be. Anyway I think it's enjoyable. Rated 4 out of 5 by Torpedo1 from Very well done The art work is beautiful and the adventure is so fun. Plenty to do. Two different kinds of HO's and a active map to jump around with. Rated 4 out of 5 by VickiS531 from Very nice game but... As others have said, this game has quite a few things to recommend it: - Multiple difficulty levels, 4 (including custom) - Collectibles - Mix of HOG (finding items by silhouette and by name) - Achievements I gave this 4 out of 5 due to a couple of things: - Too many cutscenes. I get annoyed when I start a game and even before I can type in my name I get a cutscene...this one has TWO plus everytime I did something it seemed like another cutscene appeared. - Lack of a HELP. One of the achievements is to get golden paws on every HOG, it took me 15 minutes of frustration to realize they want you to replay the HOGs in the extras category. Also, I don't see how you can get the achievement for doing the binoculars correctly on the first try, I did and still didn't get the goody. Eipix did a very nice job on this game, I didn't care for the first one (Chinese something#, the Spring one #2nd) was very pretty...saying that, my favorite developers are still Blue Tea and Elephant Games. Rated 4 out of 5 by alsteele28 from Some guidance that the game missed out! This as others in the series is a good strong game with good solid story and good VO, special effects and music. There is though a few things that I feel let the game down slightly and that should have been made clear. 1) The usage of the 'amulet' this was not explained and it was only because I had played others in the series that I had some grasp that there was a 'special item' that is used and manipulated to perform actions. 2) The binoculars were never explained and had I not clicked on a random area I would have not even known of their existence. Again it was not really clear how these were used and in what circumstances until you needed to use them for the first time. 3) The third thing that I feel was not explained properly was the fact that you could do a 'marble shooter' type of game instead of the HO scenes, this I grant you was different than the usual Mahjong 'alternatives', but again this was not explained anywhere and it was only after about the seventh HO screen that out of the corner of my eye I saw this (yes I know top marks for observation). I feel therefore that these are four major elements of the game that were not explained, which I felt should have been no matter what starting level you choose, as if you were new to the genre then you would have been left feeling very confused. As it is I had fortunately played others in the series so I was fairly au fait with these even though there were slightly different in the others. One final thing I will say with regards to the the level choice is that even on the 'expert' level you were given 'sparkles' and the hint bar which for this level filled up rather quickly. If you have played others in the series then yes I would highly recommend purchase of the game, if however you have never played others in the series then I would recommend you demo the game first and try to get to grips with all the different elements to the game, hopefully the above would help, then make a decision.